The effect was very rapid. In just a few seconds, that boy/patient of mine suddenly complain of numbness, then shortness of breath then stop breathing, turn blue and collapse. Luckily this happen before my eyes in a facility where I can immediately grab my laryngoscope and endotracheal tube and intubate the patient immediately. I wonder if he came just a bit later to Hospital. I do not wish to know what happen then. 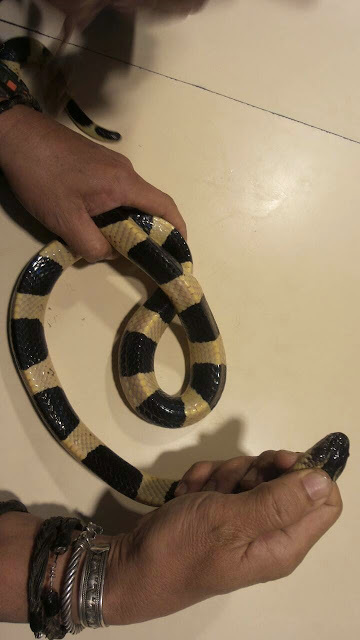 One of the earliest person I ask regarding this snake is my dad. In a glance, he said that this is a very venomous snake. He said usually found near mangrove area. Turn out to be he is right. Experience is better than just read knowledge. I never had any experience seeing this snake or any other snake. All i ever saw before this just the constrictor and most of them were in zoo or in a show by a professional snake handler. 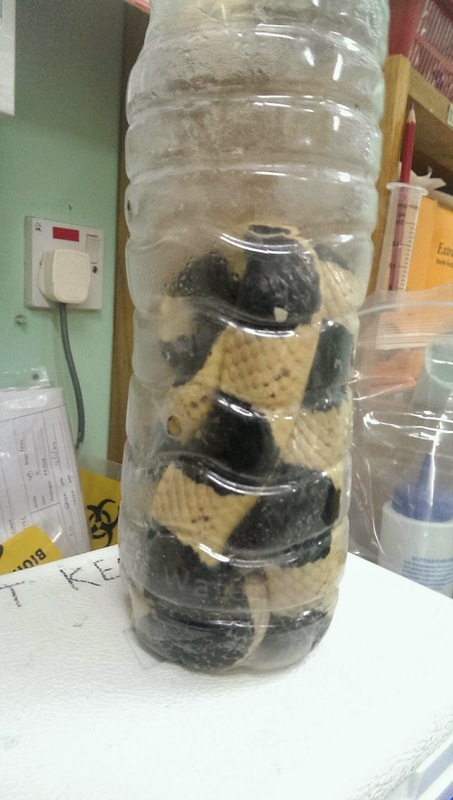 This is the first Krait here in Sipitang for the past 2 years. Before this always had a patient who was bitten by a green pit viper. I wonder if there is still a lot of this snake out there. Should always keep neuropolyvalent anti venom in my hospital. The snake was caught alive and put inside this small bottle. The snake is small but the venom is quite potent. That same snake handle by a professional snake handler in tertiary hospital after my patient transferred there. Oh please stop this snake bite fiesta here in my district. This is getting more common nowadays. From non venomous, to Green Pit Viper then now Krait. Xbox 360 Slim : Do I need new adapter? Big Flood in Malaysia : God Hand at work? Who should or should not be called Doctor?